The children experience the texture and feel of clay while making pinch pots decorated with clay coils. For ages 3 to 6. Plan 2 sessions. Click here for more information on working with clay. Clay needle tool or sharpened pencil to write names on the bottoms of the pots. Note: Three- to four-year-old children will concentrate on the pinching process, so plan one ball of clay for each child plus plenty of extras. In addition to making pinch pots, the five- to six-year-old children will be introduced to coil-making to decorate their pots, so they will need two balls of clay for each child plus extras. Since the balls of clay sized to fit the children’s hands will be surprisingly small, the pots can be built in one session. The strength in young children’s hands is still developing, so the clay should be wetter than usual. This will also prevent cracks from forming as the clay is being stretched and allow the coils to be attached without having to scratch and slip the clay. Set out small balls of clay covered with plastic until ready to use. Set aside a needle tool or sharpened pencil to put names on the bottoms of the completed pots. Have trays and plastic covering ready for drying pots. Explain to the children that they will be pinching balls of clay to form pinch pots. 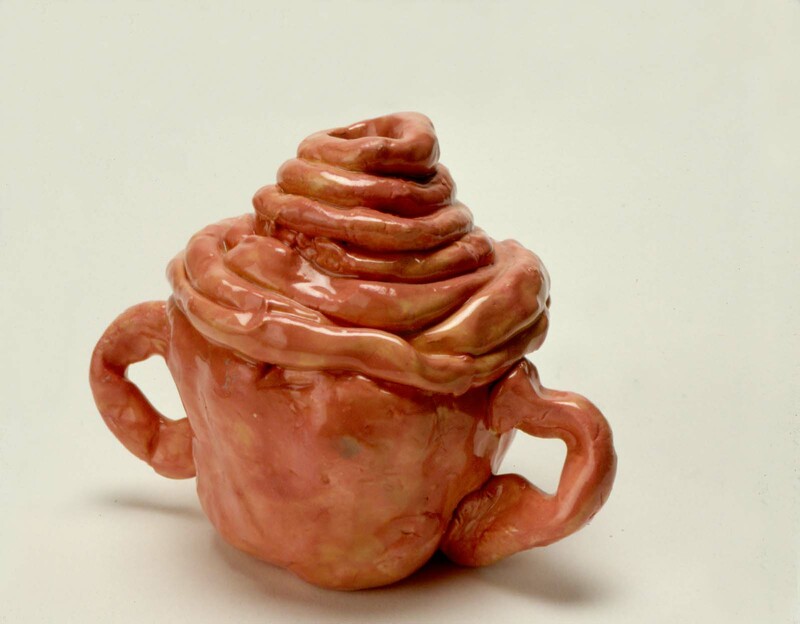 Demonstrate how to make a pinch pot. Roll a ball of clay between your palms to make it round. Explain that one hand (usually the less-dominant one) will hold the clay, while the dominate hand does the pinching. Place the ball of clay on the less-dominant hand, keeping it opened flat so that the fingers will not be in the way while pinching the clay. Using only the thumb of the other hand, press it into the center of the ball until it is about one-half inch from the bottom. Emphasize that only the thumb will go inside the pot. Pull out your thumb and show the children the hole made in the pot. Explain that you are going to make the hole larger by pinching its sides. With your hand in the air, show the children how to pinch with the fleshy parts of their fingers and thumbs rather than the tips which will cause the clay to break off. Place your thumb all the way to the bottom of the hole, and with two fingers on the outside, pinch gently. Rotate the pot about one-quarter inch after each pinch. Working slowly and concentrating on the feel of the clay, continue this movement of pinch and turn, pinch and turn, all the way to the original starting point on the ball of clay. Show the children how the hole has grown. Repeat the pinching process slowly to avoid stretching the clay too quickly. Emphasize that once a pinch is made in the clay, it must be repeated all the way around to the starting point to maintain its roundness. Give each child a ball of clay and explain that they will be working together, step-by-step, to make the pinch pots. 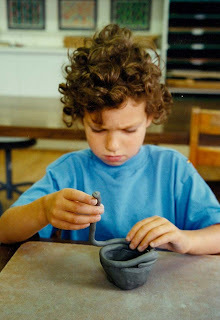 Explain to the children that they will be decorating their pots with coils or rolled “snakes” of clay. Show the children how to make a coil. 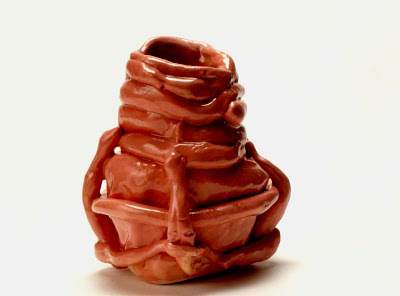 Break off a small chunk of clay and roll it between your hands to form a snake-like shape. Put the “snake” on a flat surface. Starting with your fingertips, roll the clay down to the bottom of the palm of your hand and back to your fingertips. Repeat this motion moving up and down the coil, gradually increasing pressure until the coil is about a one-quarter inch in diameter. Discuss ways that the children might use coils on the pots; such as adding handles, smoothing the lip or top of the pot, decorating the sides of the pots, or making the pot grow taller. Have the children roll several coils and then add them to their pots. Note: Using a needle tool or sharpened pencil, carve the children’s names on the bottom of the pots and store them on trays, loosely covered with plastic. Dry the pots slowly and thoroughly before bisque-firing them in a kiln. Set out underglazes and brushes. Explain to the children that the pots have been fired for the first time in a kiln and are referred to as bisque, which is very fragile. Emphasize that the bisque-fired pots must be handled carefully. In this session the children will be adding colors to their bisque pots using paints made specially for clay called underglazes. Demonstrate how quickly the underglazes dry when applied to the bisque-fired pots. Dip the brush often to avoid scrubbing and to cover all areas, dabbing into any cracks or rough areas on the clay surface. Carefully brush away any puddles of underglaze that may form. Have the children paint the insides of their pots with two coats of underglaze and then paint the outsides with two coats of the same or another color. Note: Let the underglazed pots dry overnight. Then apply a coat of clear glaze, let them dry again, and glaze-fire them in a kiln. Since the clay is held in the hands while pinching a pot, it is not necessary to cover the work surface. Coils can be rolled on a hard surface without sticking and the area can be easily wiped clean. In order to have good control of the clay while pinching it, the balls of clay must be sized to fit comfortably into the palms of the children’s hands. The balls will be surprisingly small. Ask the children to pinch in the air to be sure they understand using the fleshy parts of their fingers and thumbs. 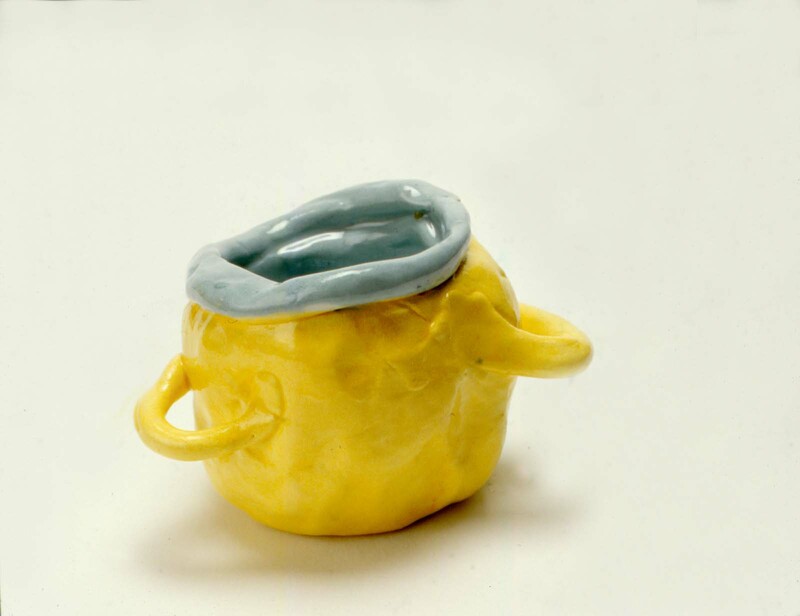 Expect the pots made by the three- to four-year-old children to be tiny, crooked, and charming. Working with clear glaze is more complicated than underglaze, so it should be applied by an adult for three- to six-year-old children. When working with a large group of children, place small pieces of paper with each child’s name on a tray. The children can set their completed pots on their names. After the session, use a needle tool or sharpened pencil to write the names on the bottoms of the pots. Review the process of pinching a pot. Discuss how using the thumb made the insides of the pots smooth. Talk about the variety of ways that the coils changed the pinch pots. I pushed my thumb all the way through the clay. My pot is very fat on the bottom and skinny on top. Uh oh! The top of my pot came off in my hands. I’m finished but the sides of my pot are falling down. Look. I invented a “pinkie pot.” I used my pinkie inside the pot instead of my thumb. If you pushed too hard with your thumb, try again with another ball of clay. Be sure your thumb is at the bottom of the hole before you start pinching. If you use the tips of your fingers and thumb to pinch your pot, it will break off. Try again using the fleshy parts of your fingers and thumb. You must work slowly and pay attention to the clay while you are pinching. If you stretch the clay too quickly it will become weak and start to sag. 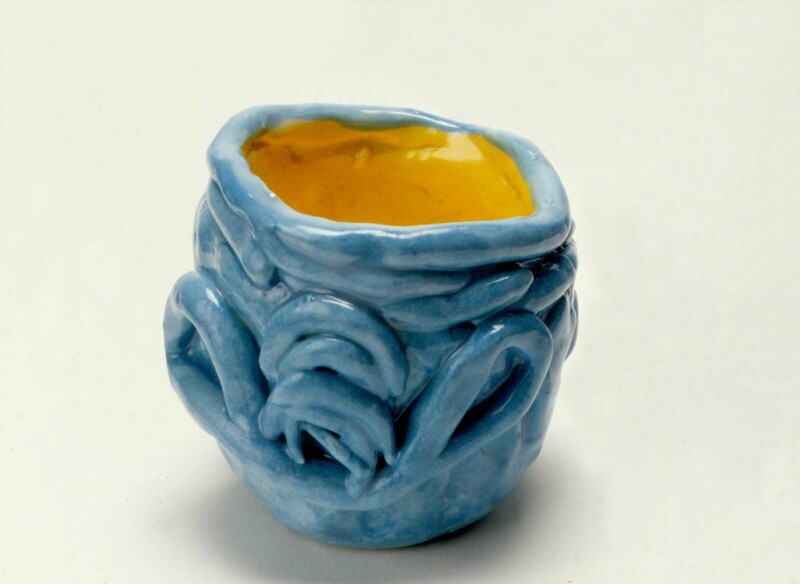 When making a pinch pot, it is important to use only your thumb on the inside of the pot. This will help to keep it round and smooth.